Effective technical communications are a cornerstone of Nexight’s approach to solving complex problems. It’s not enough to just conduct research, talk to stakeholders, or facilitate a meeting—you have to compile and communicate the results in a clear and concise way that resonates with your audience and inspires them to act. That’s why at Nexight Group, we strive to craft communications materials that use smart design and sharp technical writing to effectively convey compelling, accurate messages. Fortunately, we’re not the only ones who think we do great communications work. 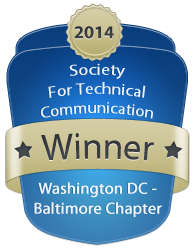 I’m happy to report that for the fourth year in a row, we earned some third-party praise from the Washington, DC – Baltimore Chapter of the Society for Technical Communication (STC) in the form of four awards from their annual technical communications competition. Plastics and Polymer Composites Technology Roadmap for Automotive Markets, Distinguished Technical Communication – Developed in partnership with the American Chemistry Council, this roadmap provides the plastics and polymer composites industry with an actionable plan for achieving the roadmap’s vision of gaining recognition by the automotive industry and society as preferred materials solutions by 2030. How to Put a Price on Power Loss, Award of Excellence – This interactive infographic provides the Department of Energy with a tool to help stakeholders quickly understand and then dig deeply into the complex topic of why utilities need reliable value-of-service estimates to make cost-effective investments, and what actions are needed to develop a sustainable strategy for updating value-of-service estimates. A Comparative Analysis of Greenhouse Gas Emissions from Propane and Competing Energy Options, Award of Merit – Developed with support from the Propane Education & Research Council, this study provides an easy-to-understand, side-by-side comparison of the quantified greenhouse gas emissions associated with the production and use of propane and other fuels in several applications of importance to the U.S. propane industry. Cooking for Life: Roadmap to a Billion, Award of Merit – This roadmap outlines a clear plan for achieving the World LP Gas Association’s Cooking for Life initiative goal of transitioning one billion people from traditional fuels to cleaner burning LP Gas by 2030.